Kaiser's workers and patients have had enough of epic waiting times and surging suicide rates. More than thirty years have passed since the first “revolution in mental health”—the deinstitutionalization movement that moved patients out of segregated mental health hospitals and, in theory, back into their neighborhoods to be with their families. But a generation later, many are still waiting to receive basic care in their communities—the therapy they require to live with the dignity and freedom the movement fought for. Earlier this month, mental healthcare workers across California went on strike to show that everyone’s tired of waiting—patients are tired of delayed appointments, workers are exhausted by understaffing and stalled contract talks, and the system suffers from an outmoded infrastructure that fails to meet growing community needs. Clinicians at the healthcare and insurance giant Kaiser Permanente simply want the company to follow the law: California’s relatively progressive mental health parity regulations mandate that providers offer mental health services “under the same terms and conditions applied to other medical conditions.” Meanwhile, the added insurance resources of the Affordable Care Act have raised hopes for reform. But many others may be unable to afford services outside of Kaiser’s insurance system. They’re stuck with a service infrastructure that has, despite billions in annual profits, been criticized for years for poor services and inadequate performance monitoring. A 2013 state audit found that despite a standard two-week wait time for non-urgent appointments, at one facility, “between 18 percent and 32 percent of the wait times exceeded 14 days.” Kaiser got fined $4 million for various service deficiencies, and has faced various patient lawsuits. While many converging problems have created the crunch, including rising enrollment as well as chronic understaffing and inadequate recruitment efforts, the bottom line is that these patients are insured, yet their needs have been neglected on an epidemic scale. The crisis at Kaiser may intensify as the Affordable Care Act enrolls more people in new insurance plans. Moreover, these service gaps at private insurers come in a context of a nationwide mental health crisis, with massive unmet needs among highly vulnerable populations, like the uninsured, children, and the incarcerated.The union’s seven-day strike was their most dramatic call yet to resolve the staffing shortages not just with acute care—recruiting and hiring more staff for facilities with service gaps—but also preventive measures: a new system to incorporate clinicians themselves into key personnel decisions. NUHW President Sal Rosselli says that empowering staff themselves to participate in decisions on personnel needs is the most ethical and efficient way to manage growing care needs: “Our simple proposal was that we establish a committee of psychologists and managers at each clinic that work on the staffing situation for that hospital or clinic, and come up with a resolution.” A third-party mediator could be called upon to resolve disputes. 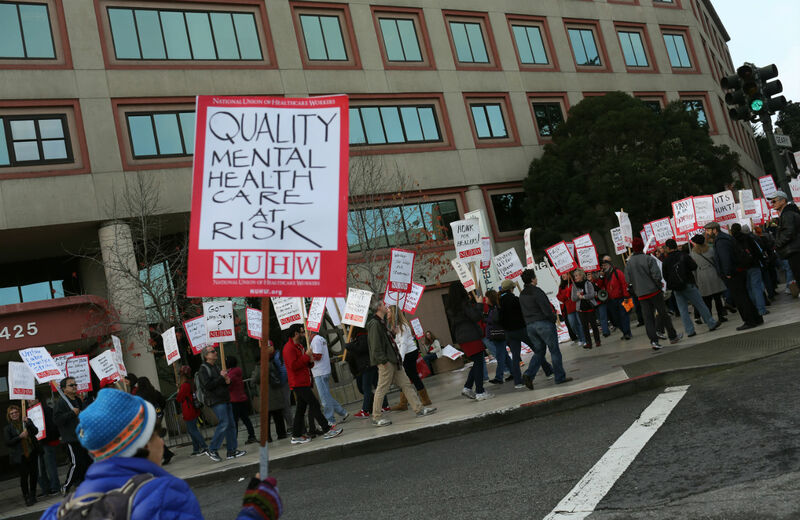 For now, NUHW’s negotiations are set to resume with Kaiser, and their agreement could set a nationwide template for mental health parity. Paradoxically, striking was a demonstration of care amid crisis: workers felt the least “counterproductive” way to use their labor was to withhold it to send Kaiser a message: waiting a week for services was still a much shorter delay than what they and their patients deal with every day.